Alonzo Hawk: [flinging the window open] You idiot! What do you think you're doing? Window washer: Washing the windows. Every Wednesday. Mr. Hawk's orders. Alonzo Hawk: I'm Mr. Hawk! Get outta here! Window washer: Okay. Cancel the windows. The original characters Jim and Tennessee are disposed of with throw-away lines. I find it hard to believe that Jim would "go off to Europe to race foreign cars" (and leave Herbie?) 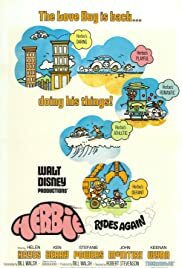 when it was practically the entire premise of The Love Bug that Herbie was just as good, and better, than any of them. It may be "good for kids" but a good movie can get adults to enjoy it just as much.